John H. Milner, Chief Gunner's Mate, born Nov. 24, 1918, Headland, AL. He enlisted in the USN at Mariana, FL, and was sent to Birmingham, AL, where he was sworn in. He was then sent to Norfolk, VA, and after eight weeks was shipped to San Pedro, CA, to go aboard the USS West Virginia. The morning of December 7, 1941, he was in 6A Div. Quarters and just completed his mess cook duties when the alarm sounded; at the end, a voice said the Japanese were attacking and the Wee Vee took her first torpedo. He was assigned to Anti-Aircraft Training Center, Navy 128, where he was taught to be a gunnery instructor; then US NOB Navy, #3245, Saipan, as instructor; US NOB Navy #926, Guam, as instructor; the USS Eldorado (AGC-11) as chief gunners mate. He was discharged at the US Naval Personnel Separation Center, Shoemaker, CA, August 1946. He worked at California and Hawaiian Sugar Co., as a packaging mechanic and packaging specialist for 37 years, retiring in 1983. He and his wife, May, have two daughters and three grandchildren, two boys and one girl. He enjoys golf, fishing, travel and working around the house and yard. 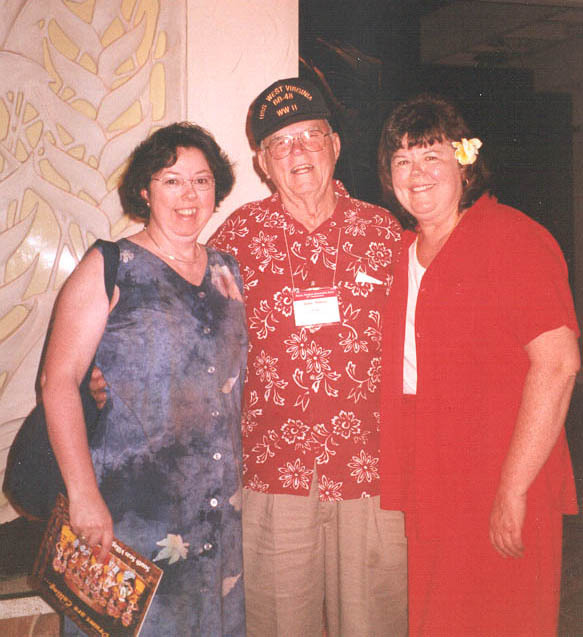 Photo of John Milner with his daughters Eileen (left) and Maureen in Hawaii in December, 2001.